Why don't figure skaters get dizzy? Why don’t figure skaters get dizzy? Round and round Mao Asada of Japan goes, in a multiple-exposure image of her short program performance in Sochi on Feb. 8, 2014. The figure skating competition is underway in Sochi, and so far at least none of the athletes has fallen to the ice on account of dizziness. Back in 2010, Cecile Dehesdin explained why. Her article is reprinted below. Figure skaters competing in the Olympic Games must include spins in their routines, then move seamlessly from these to other complex moves—like triple jumps. Why don’t they get dizzy and fall over? Practice! Coaches generally limit novice figure skaters to just one or two rotations per spin. Only after months and years of training do skaters build up to seven or even eight revolutions. (Skaters must complete eight-revolution spins to secure the highest points.) They progressively work their way up from the three basic spins (upright, sit, camel) to complex variations on those such as the haircutter, the pancake or the doughnut. Although skaters can’t rid themselves entirely of the dizziness sensation, most grow so accustomed to it that they hardly notice it—and it doesn’t negatively affect their routines. Coaches teach their pupils tricks, like staring at a fixed point at the end of the spin—much like travelers stare at the horizon to stop feeling nauseated. By settling their vision, figure skaters help their brains adapt faster. Some skaters, especially early in their careers, do breathing exercises. During training, they might spin as long as they can, stop to take a deep breath, and then spin again—repeating the pattern until they can handle multiple rotations. Skaters also learn to mask dizziness-related imbalance from the judges. There are two moments in particular when spinning may cause dizziness: at the beginning of the spin, when the skaters are not yet used to the sensation, and at the end, when they must get re-acclimated to relative stillness. 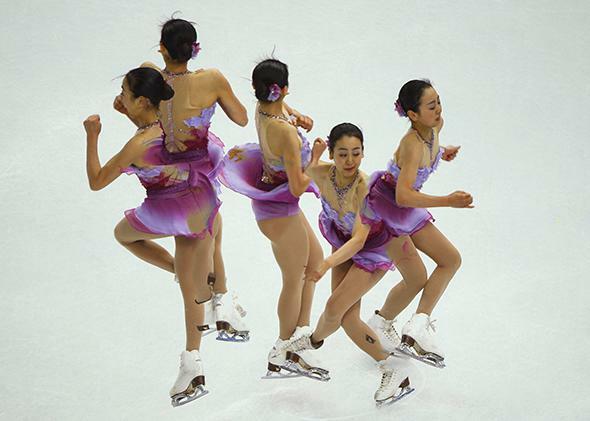 Skaters often compensate for post-spinning dizziness by integrating a small dance move into their routines before a jump. This interlude, of sorts, allows them to regain their balance. Explainer thanks Adam Leib of the Skating Club of New York, Jean-Roland Racle of the French Federation of Ice Sports, and Paul Tortland of the Valley Sports Physicians & Orthopedic Medicine.